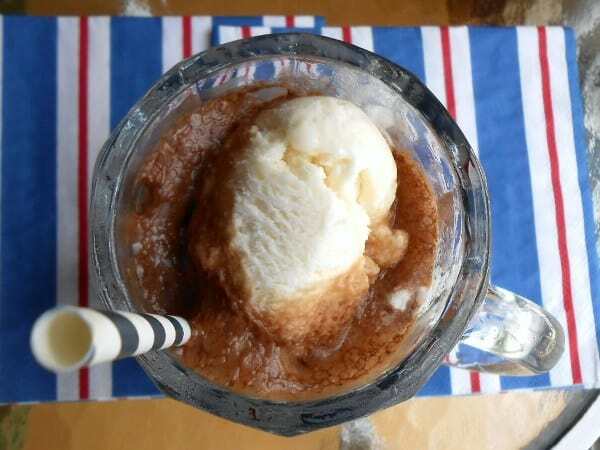 Did you know that August 6, 2013 is Root Beer Float Day? Yup, sure is! 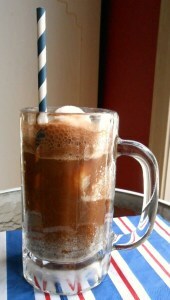 And who doesn’t love a root beer float? But, if you’re a Weight Watchers Points Plus counter, a regular root beer float will set you back between 9 and 17 points in one fell swoop, depending on where you get it. 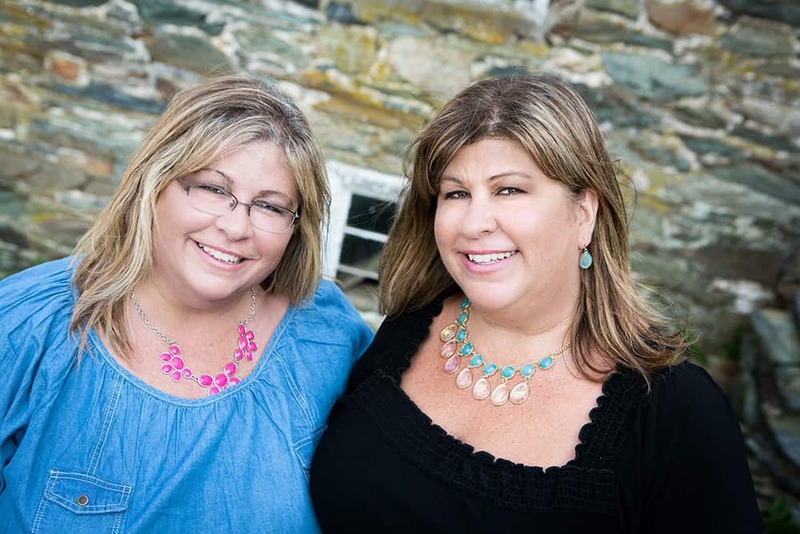 But, as anybody on Weight Watchers knows, there is always an alternative to the fattening version of what we love and what we don’t want to have to give up. So, here, I present you, the Weight Watchers Chocolate Root Beer Float at only a 4 Points Plus Value. Divide soda between 2 glasses. Add a tablespoon of chocolate syrup to each and stir. Put 1/2 cup frozen yogurt into each glass and serve immediately. 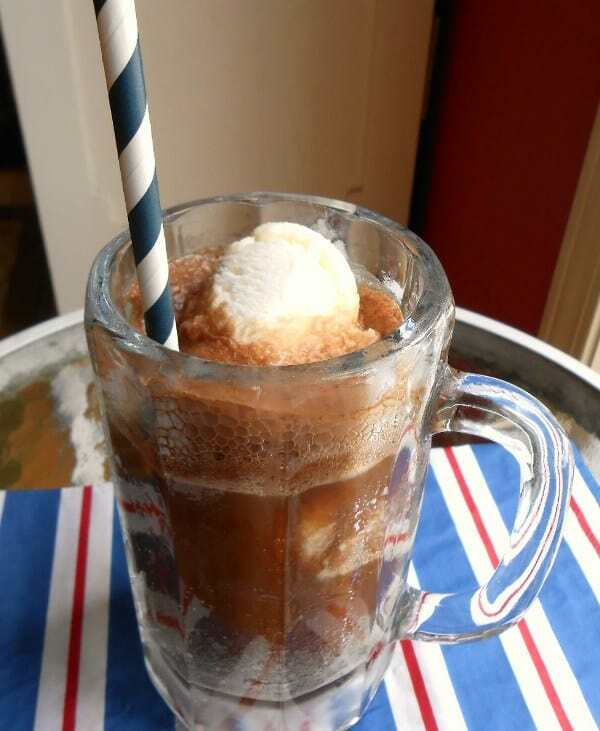 Do you know the history of the root beer float? I didn’t know either until I stumbled upon this website, Yum Sugar. According to them, “Root beer was manufactured, bottled, and sold starting in 1880, and legend has it that thirteen years later, the root beer float, which is sometimes referred to as a black cow, was first invented. 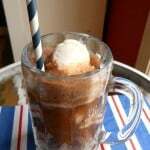 After glancing out the window late one night, Frank Wisner of Cripple Creek, Colorado, was inspired to float a scoop of vanilla ice cream on top of his glass of root beer. The illumination of the full moon allowed him to glimpse the snow on top of nearby Cow Mountain. The tasty treat was tremendously popular among the town’s children, who then called it a “black cow.” How interesting! I never knew it was also called a Black Cow. Ya learn something every day. It was super simple to make. I used fat free vanilla ice cream instead of frozen yogurt. 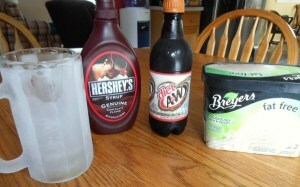 The chocolate added to the root beer, along with the creamy ice cream, made it taste like a chocolate soda. It really was good. My son drank one too. Shhhh, I didn’t tell him it was diet root beer and fat free ice cream!! 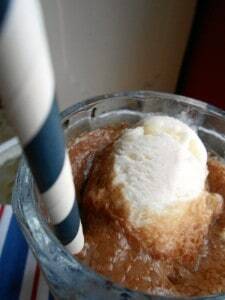 The recipe makes 2 root beer floats, but if you’re just making it for yourself, just know that you will have a little bit of root beer leftover in your bottle. 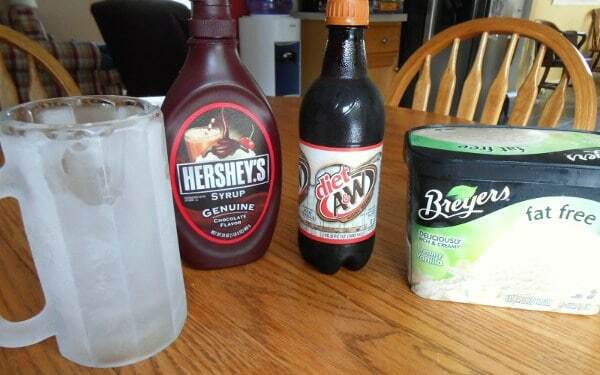 The notes on the recipe also state that you can change the soda and ice cream flavors to your liking. Chocolate-cherry and banana-fudge would also be delicious. So next time you have a hankerin’ for a refreshing, frothy treat, try out this recipe. I know you’ll love it as much as I did. And by all means, mark your calendar to drink a root beer float on August 6th! Yum! I had no idea of the history–interesting/cute! My mom loved the ones we used to get at the Hot Shoppe in Bethesda. Mmmm! I remember Hot Shoppes!